Sooner or later you will need to insert additional cells between those that already contain data. Of course, you can move the contents of those cells to make a place for new data, but there is another faster method, which I will show you in the following example. 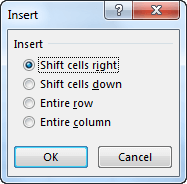 To insert the cells inside a worksheet, first select a place where you want to put them, then right-click the selection and choose Insert. When you choose this option, a window with four radio buttons will appear. By default, Excel sets the option, which it considers the most likely in this case. 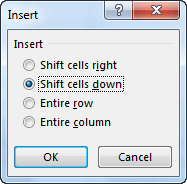 In our example, the default option- Shift cells right is the option we want. After the cells are shifted to the right, new blank cells appear in the table. In the second example, we will insert new cells below the table header. Select cells from C3 to E3. Right-click them and select Insert. This time, Excel also guessed correctly. We want the cells to be shifted down. Newly inserted cells will inherit the cell formatting from the cells that are located above or from those to the left, depending on where you want to insert the new ones.